MediMiss Arm Pain chronic neck pain neck cervical Neck Pain spinal cord what causes neck and shoulder pain whiplash syndrome What Is Whiplash Syndrome? 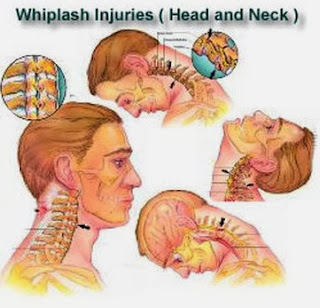 Whiplash or Whiplash Syndrome is a term used to describe an event in which the cervical spine (your neck) has undergone a rapid acceleration/deceleration which causes damage to the various tissues of the cervical spine. As in a car accident, the forces involved often include an abrupt stop or change in direction. Our head has no support above it and therefore acts as a weighted pendulum, allowing for ranges of motion in our neck to exceed their normal limit. Unfortunately, the term "whiplash" does not describe the degree or severity of the injuries sustained which may include anything from a minor strain to even death. For this reason, emergency room follow up after involvement in a car accident is the first step to rule out potentially life threatening injuries. Even at low impact speeds, there is a potential for serious injury or death and may even be accompanied by no symptoms at all. Various structures in our neck (cervical spine) have the potential for injury in this type of accident. Strained muscles and sprained joints and ligaments are very common injuries in motor vehicle accidents. Injury to the spinal cord and/or nerve root(s) are also common features in a whiplash syndrome. neck to upper shoulder soreness. Once the risk of life threatening injury is ruled out for whiplash, the next step is to rule out fracture, instability and/or neurologic involvement (injury to nerves, nerve roots, discs, spinal cord). Along with orthopedic and neurologic tests, chiropractors often use x-ray, CT scan or MRI to rule out these possibilities.